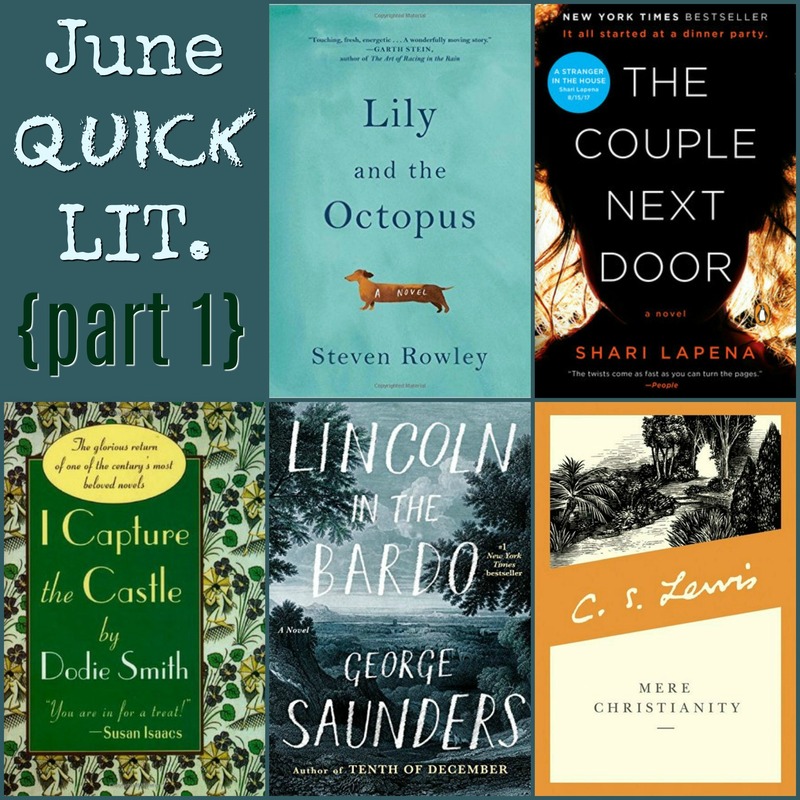 It’s one of my favorite times of the month here on the blog—the day when I get to share reviews of what I’ve read in the past few weeks! I usually split these Quick Lit posts up by Fiction and Nonfiction books, but this month’s Fiction/Nonfiction ratio was a little unbalanced, so this month’s reviews are split up according to the order in which I read them. This month I read a few of the best books I’ve read all year, as well as one of my least favorite books in a very long time. Here are my reviews! 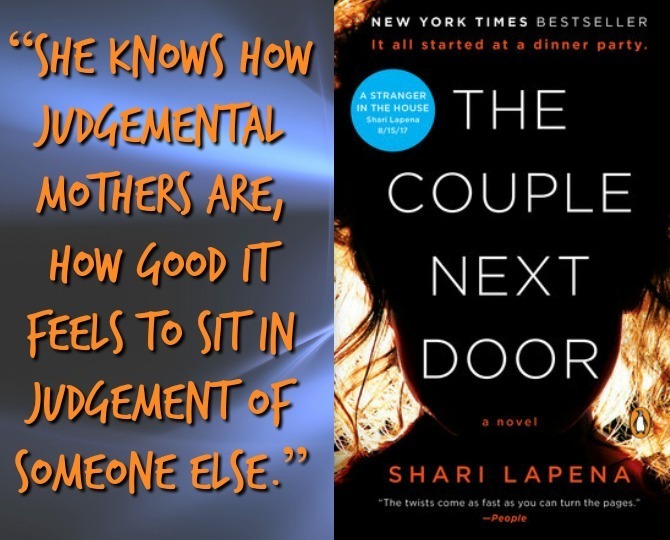 The Couple Next Door, by Shari Lapena: It was supposed to be a simple evening: a casual dinner with the neighbors while the baby slept peacefully in her own nursery, monitored carefully by the baby monitor and periodic check-ins. But when Marco and Anne return from their evening, they discover that their daughter Cora has been kidnapped. A police investigation ensues, and it is immediately apparent that none of the individuals involved in the case are as they seem. A number of suspicious factors come into play, from Anne’s postpartum depression to Marco’s failing business, not to mention Anne’s overbearing (but wealthy) parents . . . and then, of course, is the slightly unsavory couple who lives next door. In an era of fiction when nearly every mystery is described as “the next Gone Girl” (none are! ), I must admit that this book bears some striking similarities to that bar-setting thriller. Though the writing isn’t as strong or the characters as complex, The Couple Next Door shares Gone Girl’s edge-of-your-seat suspense, multi-character perspectives, and disturbing portrayal of not-so-blissful domesticity. The story has quite a few twists I didn’t see coming (some that are pretty implausible but still entertaining) and the book kept me riveted to the very end. 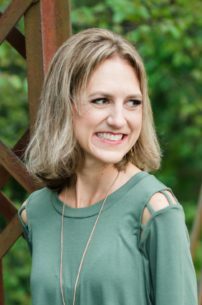 Kidnapping stories can be hard to read (especially for this sensitive mama! ), but thankfully this one isn’t too gory or graphic. 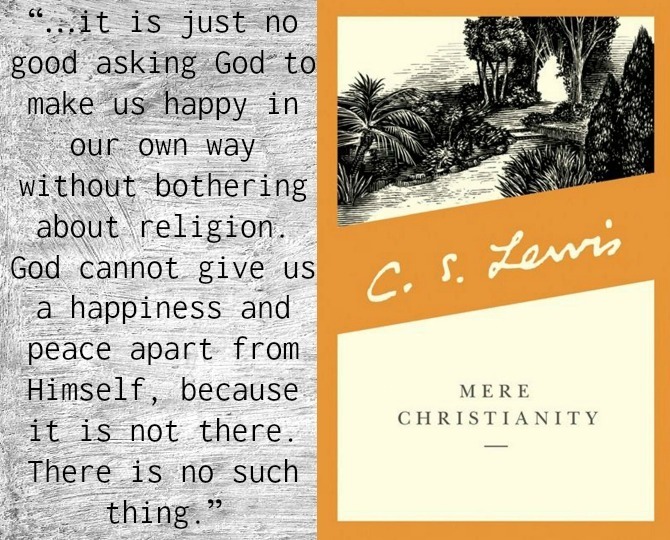 Mere Christianity, by C.S. Lewis: I love Lewis and have read many passages from this book, but somehow hadn’t read the whole thing before now. I think I was waiting for the “perfect time” to dig into this classic, but I realized there would never be a perfect time and decided to just dig in. I’m so glad that I did, and know that I will be returning to it again in the future. There’s not much I can say about Mere Christianity that hasn’t already been said. The book combines Lewis’s transcripts from a series of radio broadcasts given during World War 2, outlining the common ground shared by all who profess the Christian faith. Though decades old, the book felt surprisingly fresh in this day of fracture within the world and especially the church. It was refreshing to be reminded of the many areas that ALL Christians can agree on, and helpful to have my own perspectives on several theological issues either challenged, confirmed, or more fully fleshed out. I appreciated Lewis’s warm but authoritative tone and his willingness to think outside the box (and outside common misconceptions). I found Book 3 (on Christian Behavior) to be the most relevant and insightful section of the book, and especially enjoyed reading Lewis’s thoughts on marriage (many of which mirror my own opinions, though I’d thought they were original—I felt a sense of pride at seeing my ideas validated by this great theologian!). Everyone (Christian or not) should definitely read this book. 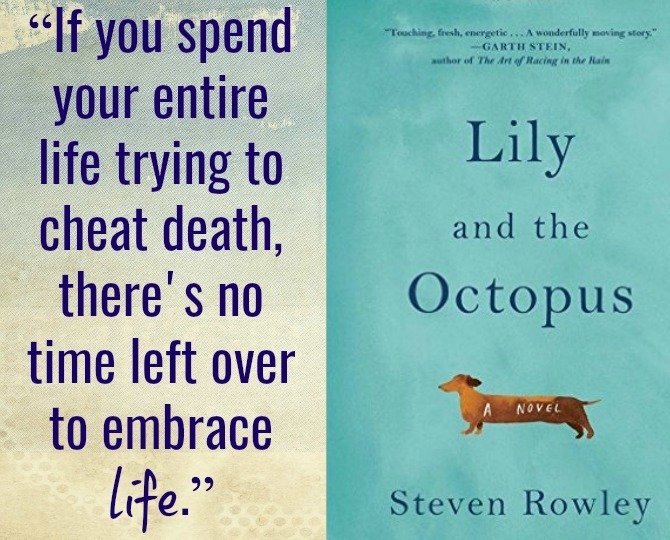 Lily and the Octopus, by Steven Rowley: Ted and his best friend (who happens to be a 12-year-old dachshund named Lily) have a wonderful life together. They chat about boys they think are cute, play board games, dine on tofurkey, and talk through Ted’s lackluster dating life. Things take a turn when Lily develops a giant octopus on her head. (Obviously it’s not really an octopus but Ted can’t stand to face the fact that it might be something else.) As Ted faces the prospect of losing his friend, he reflects on their twelve years together and all they have been through, and together they gear up to battle the evil cephalopod. This is an incredibly bizarre book and I wasn’t a fan of the magic realism element. But the relationship between Ted and Lily was so incredibly sweet that I couldn’t help but fall in love with their story. Ted is an engaging narrator and the personification of Lily is spot-on. The book is a fictionalized account of the author’s own relationship with his dog, and his experience with the subject matter is evident in the palpable emotion and grief that Ted experiences. Though it will require some suspension of disbelief, it’s definitely worth sitting through some strange elements to get to the beautiful story within. Be sure to have the tissues handy! After his son’s burial, Lincoln visits his body in the cemetery and is greeted by the dozens of other spirits occupying the bardo: men, women, old and young, slaves and free, good-mannered and ill-natured. Lincoln (and we, the reader) bear witness to their stories of love and loss, tragedy and triumph; and as they inhabit Lincoln’s conscious we are given a glimpse into the president’s own internal grief over the loss of his son and possibly his nation. 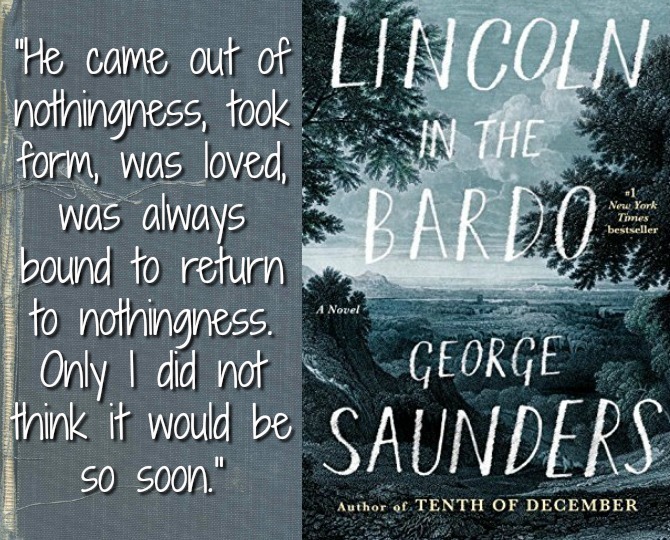 Based largely on fact, and relying heavily on historical accounts of Lincoln’s life, Lincoln in the Bardo has a fantastic premise and taps into some raw emotions and timeless themes of life, loss, and faith. But that is where this book’s merits end. The novel has hundreds of narrators whose voices are woven together in poetry-like fashion: this is a creative storytelling device, but very difficult to follow. I began the book in the audiobook format, as I’d heard it was excellent: it is indeed very well produced (I especially liked Nick Offerman’s narration) but far too confusing for me, so I switched to the eBook but didn’t find it much more coherent. The other drawback to so many narrators is that their stories—while intriguing—detract from that of Lincoln, which was my primary interest in reading this book. I also found their dialogue unnecessarily crass and incredibly bizarre. For those who enjoy poetry or appreciate experimental literature, I’m sure this book would be a treasure, but it definitely wasn’t for me. It’s a short novel but took me over a week to finish, even when combining audio and eBook—that’s never a good sign. 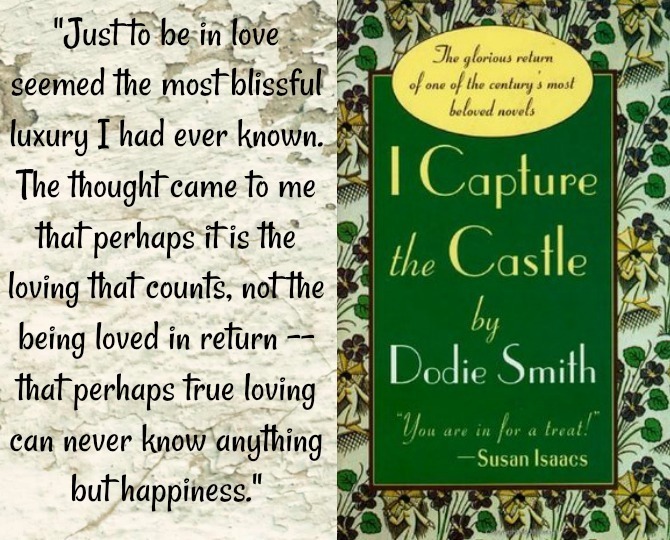 I Capture the Castle, by Dodie Smith: Published in 1948, this was my Reading Challenge book for a title written during the 1940s. I initially had a hard time getting into this journal-style novel about a family abiding in a dilapidated castle in the English countryside during the 1930s. Once the drama picked up, though, I fell head over heals for both the characters and the story. I can’t wait to tell you more in my next Reading Challenge post! Have you read these titles? I’d love to hear what you thought and whether your opinions aligned with mine. I’ll be back here Monday to share Part 2 of this months Quick Lit, with reviews of The Mothers, At Home in the World, The Dry, and two more recent reads. (<–That list may or may not have been a nod to the original Gilligan’s Island theme song; the “and the rest” for two characters always bothered me, yet here I am, playing the same game!) See you Monday!